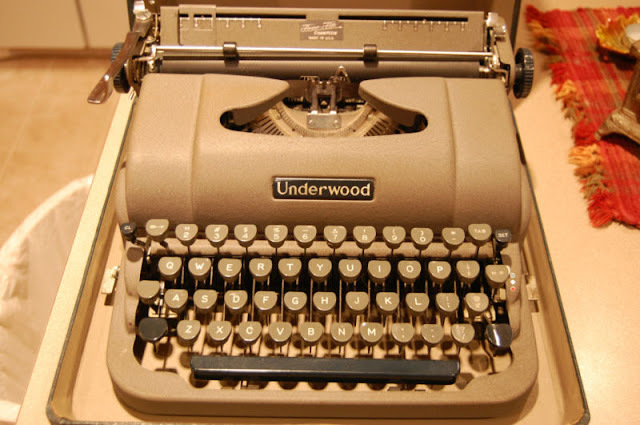 A few years ago a young Canberra couple contacted me to ask if I could help them with their Underwood portable typewriter. They had bought it online, on Etsy, and shipped it in from the US at considerable cost. The carriage wouldn't move. The typewriter had been poorly packed, but as is usually the case in such situations, it was difficult to tell whether the damage to the machine had been caused in transit, or whether it had been posted in that condition. I still suspect the latter, as apparently there was no evidence of damage to the carton. I have had very limited experience with Etsy, and so far, touch wood, it has been all good. But from considerable experience with eBay, I know there is always a massive risk, regardless of whether the typewriter is coming from Coffeyville, Kansas, or Cloncurry, Queensland. The absolute certainties in life are death, taxes, and that no eBay seller will ever own up to posting a damaged or poorly packed typewriter. Ergo, insurance coverage is worthless: the postal service blames the sender, the sender blames the post service. The Australian postal service blames the US postal service and vice versa. End result: the buyer is invariably left dudded. I wasn't at all surprised that this expensive item was damaged. What intrigued me more was why this couple had bought this particular machine in the first place. What had attracted them to it? OK, since no Underwood-made Underwood portables were sold in Australia after the Dobson-designed Universal-Champion, it was very rarely seen in this country. 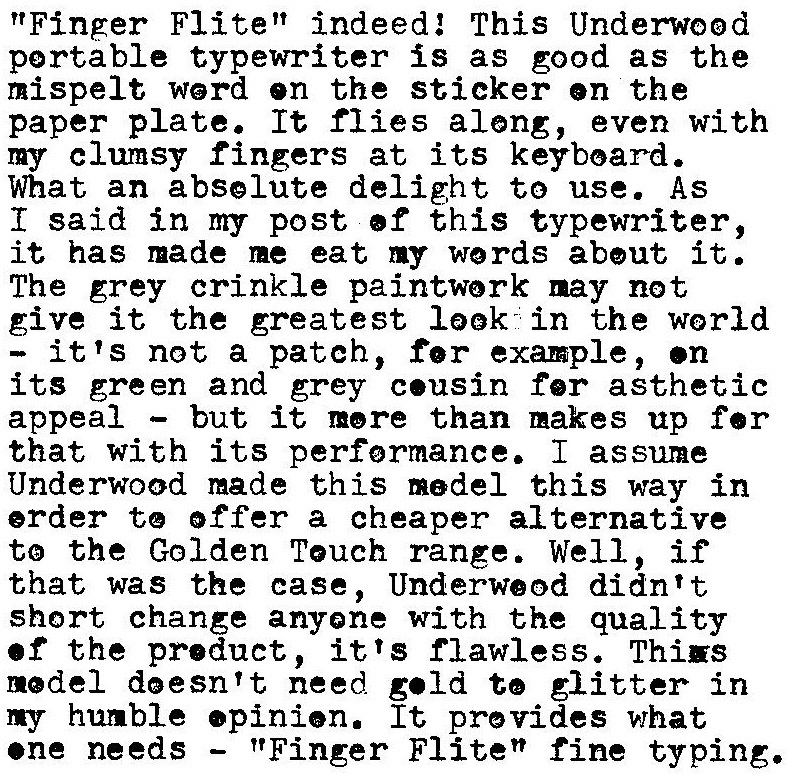 But, then, if one was going to buy online and ship in an Underwood portable from the US, why not a Braginetz- or Spilman-designed model? A Golden Touch, De Luxe Quiet Tab or Leader? Why one with a dull grey, crinkle finish? This couple's Underwood didn't much appeal to me. 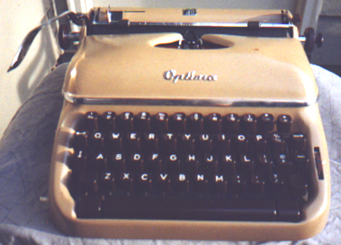 Of course, not being able to type with it, I was judging it purely on my own aesthetic values. Surely the buyers had done the same thing? Give me a shiny finish, in some colour. The only thing on this Underwood that I found attractive was the burgundy name plate on the front and the burgundy platen knobs. Otherwise it seemed very bland. I arranged for the Underwood to go to Sydney, where Terry Cooksley was able to fix it. The escapement rack was seriously buckled, and Terry was convinced the machine had received a major hit or two on the right side of the carriage. The couple sent me a bottle of wine, to show their appreciation, and I allowed myself to believe they were ultimately pleased with their costly purchase (item cost+shipping cost+repairs = probably all up at least $450-$500, I'd say). Cut to the chase ... lo and behold, I now own one of these very same models myself. I didn't mean to buy one, but I'm absolutely delighted that I did (by mistake). Let me backtrack and explain a bit more background here. Many years ago I saw what looked for all the world to me like a very appealing bright yellow Optima portable, advertised by Scott McNeill at the Vintage Typewriter Shoppe. Up until then, Scott and I had had a great thing going. But this Optima arrived smashed to bits. Not Scott's fault, he had packed it right up to his usual high standards. This turned out to be the most frustrating and upsetting experience of my typewriter-importing career; happily, it stands alone. 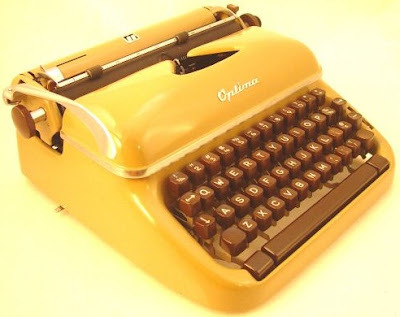 What added to this pain was that the typewriter wasn't yellow at all - it was brown! I really thought I'd been sent the wrong machine - busted up and in the wrong colour. I saw this item listed on US eBay. My eyesight isn't the best these days, and I allowed myself to think I was looking at a De Luxe Quiet Tab Golden Touch. I have one of these in the classic pale green and grey, but had coveted the tan-and-fawn versions I'd seen in the collections of Richard Polt and Martin Rice Jr. Richard also has one in black-and-cream - believe it or not, we unwittingly went up against one another in the bidding for this. Richard alerted me to the fact, and offered to back off, but I told him to go ahead with it (I already felt guilty about pushing up the price). I'm glad I did. Richard seems to have had much fun with it. From memory he likens the colour pattern to a 50s cop car. 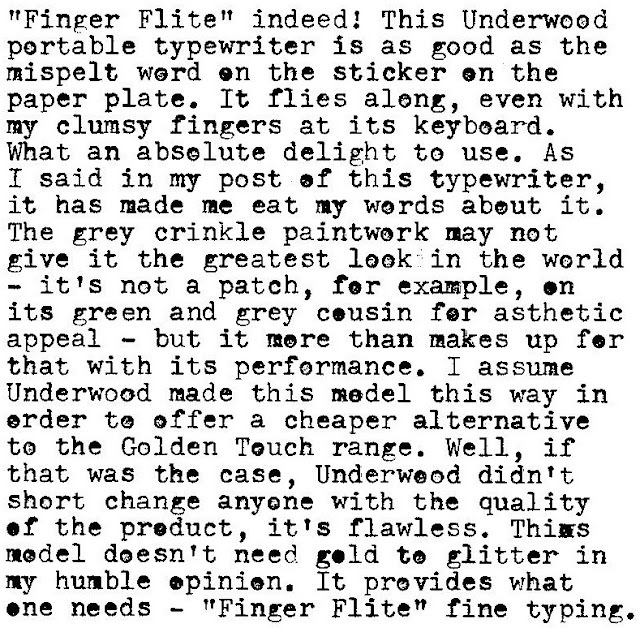 So here I was excitedly awaiting the arrival from the US of a fawn Underwood De Luxe Quiet Tab Golden Touch, with fawn keytops, just like Richard's or Marty's. After some time, the parcel duly arrived. The case looked in great shape - but it was a deep bluey-green shade. Funny? Hey, but so what? Nice fawn machine inside. Nope! Dull grey crinkle finish with dark blue name plate and platen knobs and grey keytops. Oh, oh! Expensive mistake! Did I get the wrong machine? No, I checked straight away, and what I saw on eBay was what I got. A "Finger-Flite" Champion! I've long since been aware that the colour one sees on a typewriter listed on eBay may bear no relation to the colour the machine actually is - but then I forget to remind myself not to judge a typewriter by its colour. Wrong machine, did I say? Naturally, without delay, I test typed on it. RIGHT machine! Very right. Love it! In fantastic, near-new condition. Types beautifully. This stays right where it is. 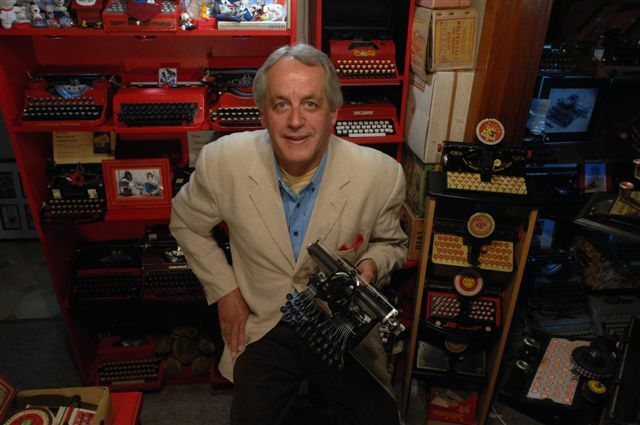 Who would have thought that a story about typewriters could be this captivating? I enjoyed this post thoroughly. I am a huge fan of Underwood typefaces. There's just something...sort of tall and "blocky" about them that makes it distinctive on the page. I happen to LIKE the gray crinkle paint. It is certainly indicative of the era in which it was made. Another piece of history! Well, I'm glad the Underwood works so well! Not typical for '50s Underwood portables, which seem to get rattly with age. Colors on eBay photos can be very misleading. One thing you can do if you have Photoshop is the Auto Levels command, which will eliminate a yellow tinge, for instance, and yield a more realistic image. Will you be repainting this puppy? Glad you got one that worked so well! The tuxedo Underwoods are attractive machines. There don't seem to be many around. Curious too if you're going to customise the colour. OH! You bought that one! I was keeping an eye on that, with the intention of painting it up. I decided against it at the last second. I'm glad someone I knew got it. I also thought it was a rusty brown, but I did realize that the white balance in the photo was rubbish. I still rather like it in the grey. Thank you Cameron, Richard, Caroline and Scott. Cameron, I couldn't agree more about the typeface. That's what I started with in 1957 - loved it then, love it now. The problem I have with the grey crinkle is that unless the machine has been kept clean (or little used and stored away in its case), the dirt gets into the paintwork and can't be shifted without damaging the finish. As this one is exceedingly clean, I wouldn't be touching it. The thought of repainting the puppy did cross my mind, but only very fleetingly. Well after owning multiple red, black or blue machines I pretty want to get a "dull grey" typewriter for my collection. There are no Underwoods are on sale here, so I think I'll once get a newer Consul portable. They often come in a grey finish and they are also pretty affordable. I must tell that I love the unexciting office colors. They are simple yet they also look elegant. Rino, here was me downstairs just a minute ago thinking about you, and I come upstairs to find a comment from you. Must be ESP! I was thinking about you Rino because I am about the post on my Brilliant S and was wondering about the Atlas you found, the Cherry Blossom or whatever it was called.